It’s the summer of 2016 and the world has PokeMania! I have to admit that I haven’t downloaded the game, mostly because I suspect our family would end up obsessed with it and spending the kids’ college funds on our data plan. I am just old enough to have missed Pokemon when I was growing up, but my kids watch the show on Netflix and love it. 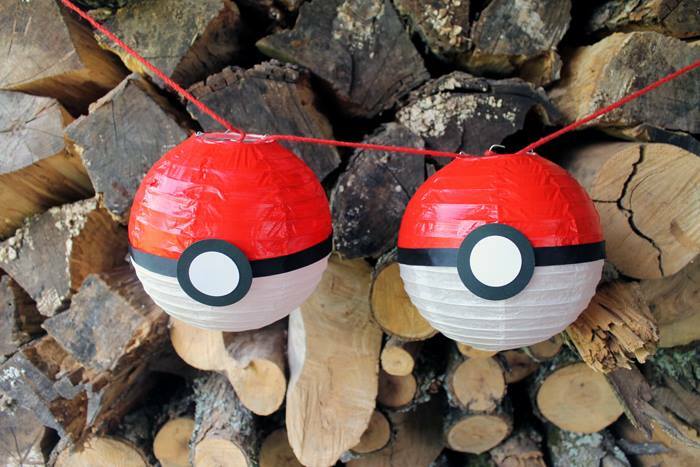 A group of bloggers and I are sharing fun Pokemon themed crafts today. 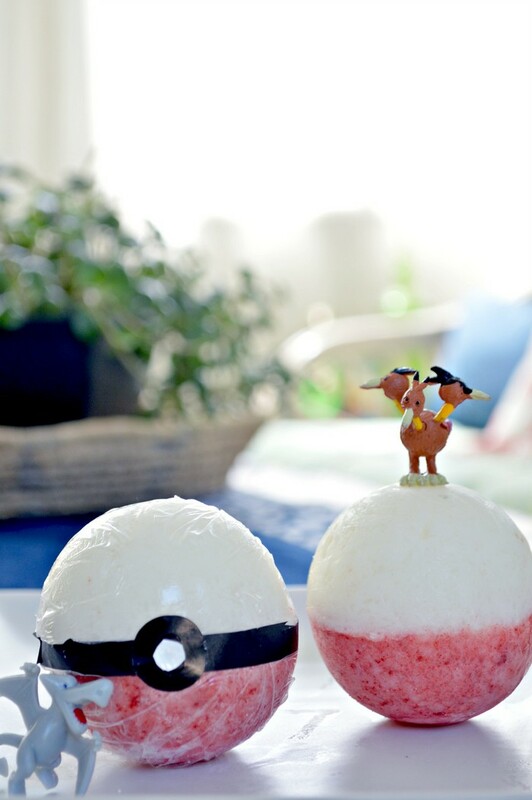 Since I was already doing bath bomb week, I found a way to combine the two ideas… Pokeball bath bombs! These are simple and fun to make, but even MORE fun to use. 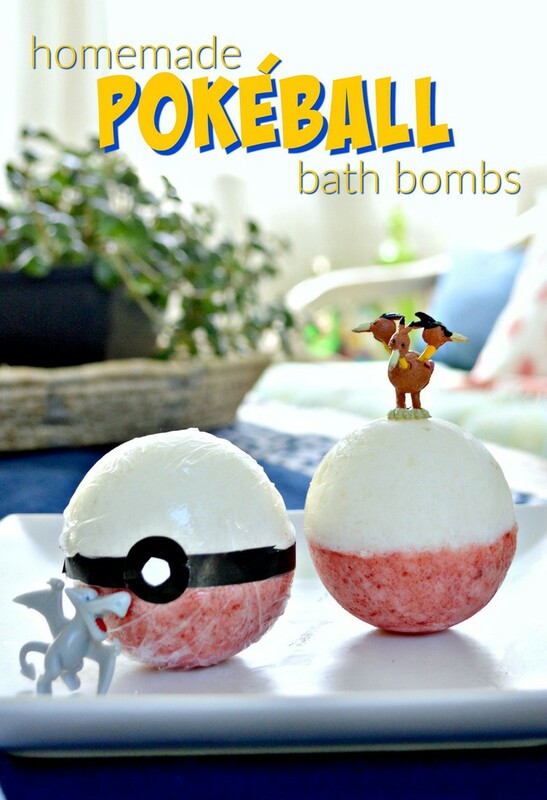 You can easily make this project with your Pokemon-loving kids, and use the bath bombs as incentive to take a bath after a long day of hunting for pocket monsters in the app. I used a slightly different recipe to create the Pokeball bath bombs than I did for my regular ones. 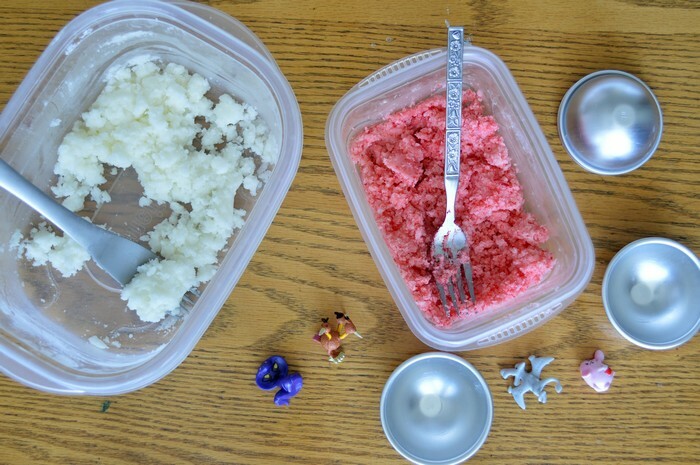 In this recipe I used: 1/3 cup citric acid, 1/3 cup Epsom salt, 1/3 baking soda, 2/3 cup corn starch, 2 tablespoons of coconut oil, fragrance oil and food coloring. 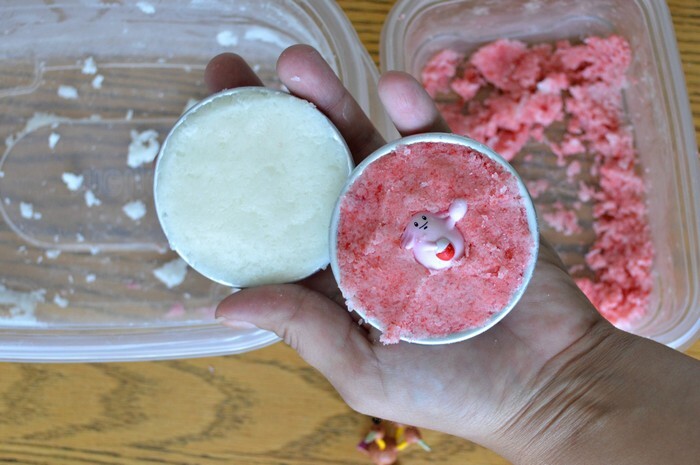 This recipe creates sturdy, dense bath bombs. I wanted sturdier, less crumbly spheres because I hid small Pokemon figurines inside of each bomb. I ordered the Pokemon toys off Amazon and then had my brother-in-law identify the 1st generation Pokemon (the ones in the Pokemon Go app). I filled half of a bath bomb mold with red mixture and half with plain white. I pressed one of the mini toys into the mixture, and combined the two halves like normal. I placed the molds in the freezer for an hour so the mixture would set up. Now Pokeballs are not just red and white spheres. To make the bath bombs really look like Pokeballs, I added the details to the packaging. I wrapped each bath bomb in plastic wrap and secured the wrap with black tape. I added a black tape circle and topped it with a white tape circle to create the button on the Pokeball. 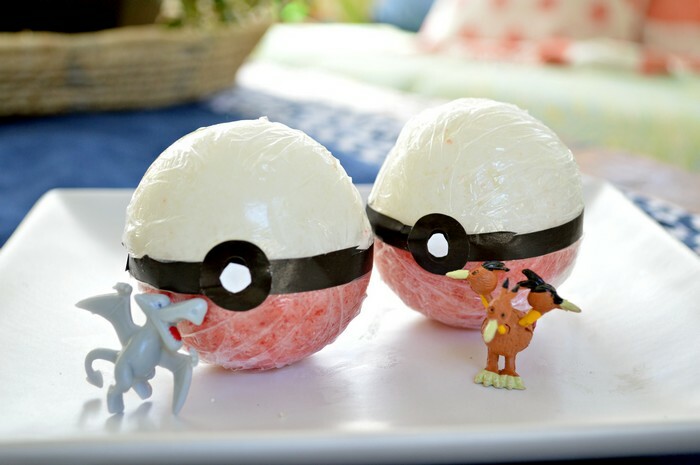 These would make fantastic party favors at a Pokemon themed birthday party! Have your Pokemon Go fan get in the tub and allow them to drop the bath bomb into the water. The ball will fizz and turn the water a light pink. 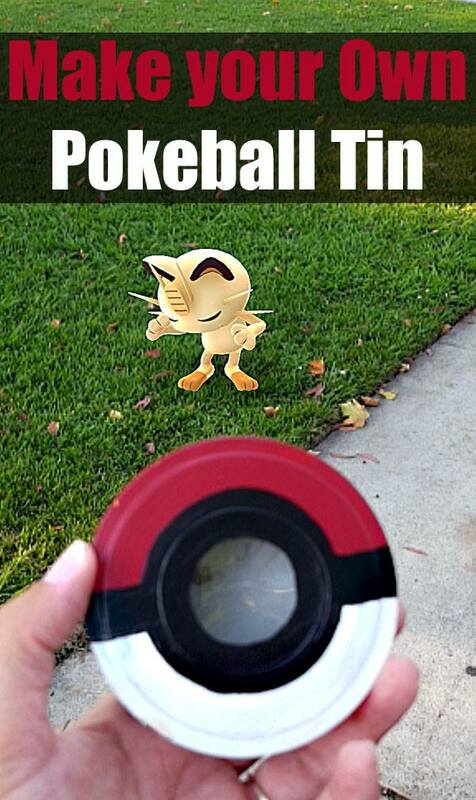 Finally the Pokemon caught in the Pokeball will appear! NOTE: Because of the higher proportions of oil in these bath bombs, your bath water will be exceptionally silky, but your bathtub may end up extra slippery. Please be cautious! 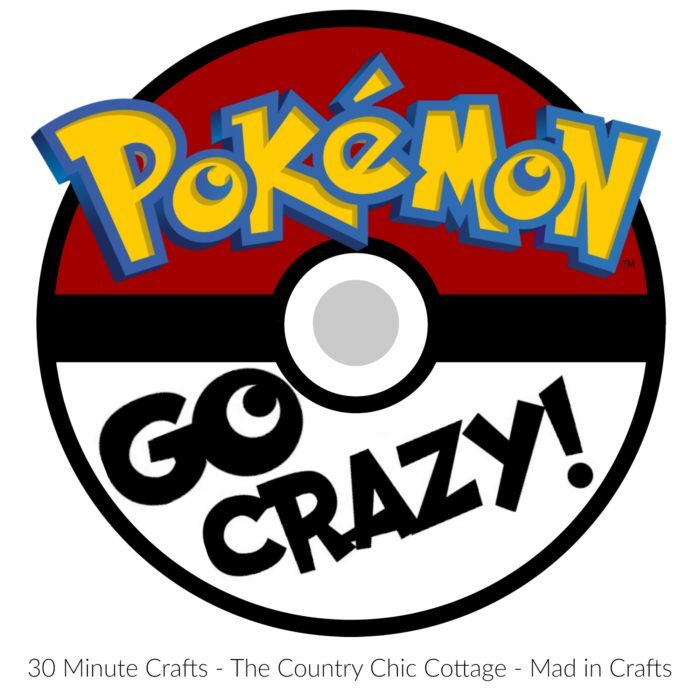 If you are as Pokemon crazy as the rest of the world, you will want to check out these fun projects from my friends Angie and Carolina! What a fun project! I bet my teen would love to make these with me & use them.